Support the making of "Pablo Neruda: The People's Poet"
After seeing extended excerpts from the film-in-progress, best-selling novelist Julia Alvarez (How the García Girls Lost Their Accents, In the Time of the Butterflies) wrote, “This documentary will give us our Neruda, vigorously, diversely, enchantingly brought back to life.” It is through the support of people like yourself, who love Pablo, poetry, and social justice, that the film will be completed and shown throughout the world. Join us and in return, you’ll not only have the satisfaction that comes with being a special part of this project, but also the gifts we offer in appreciation for your generosity and enthusiasm. Donate today and, when it’s finished, we’ll send you your own digital download of the film that you helped make happen! 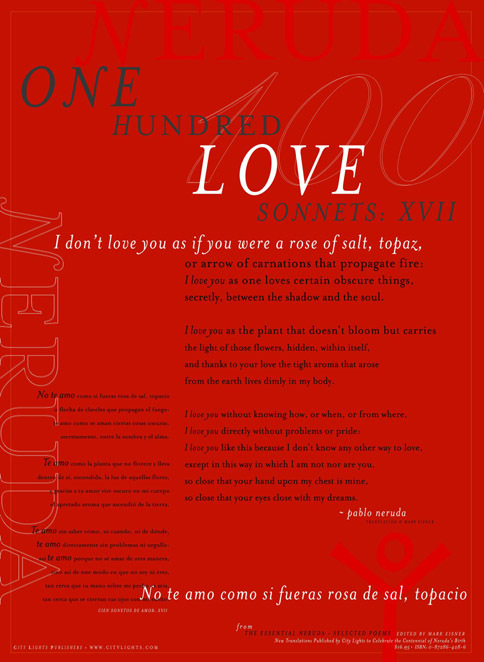 FOR A LIMITED TIME ONLY, AN AWESOME NERUDA LOVE SONNET POSTER IS AVAILABLE AS A THANK YOU GIFT! CLICK HERE. As a supporter, you’ll become part of the grassroots community that has enabled this journey, you’ll be kept informed of all our progress and have insider knowledge of events and happenings. Red Poppy (the non-profit behind the production) is a 501(c)(3). All donations, less the cost of any gift received, are US tax-deductible. 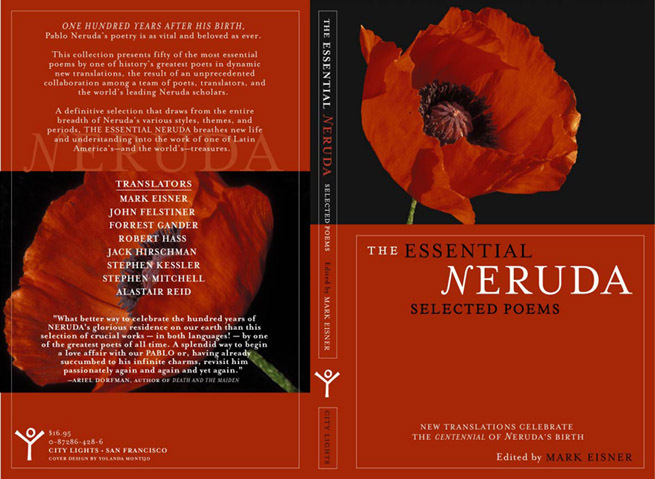 With this donation, you'll get the digital download of the documentary and a copy of The Essential Neruda: Selected Poems, which can be signed with a personal inscription to you or someone else by Mark Eisner, its editor and a producer of the documentary. Enjoy free shipping across the US. Contact us to learn more about international shipping. You'll get all the gifts above: the film digital download, a copy of The Essential Neruda (signed if requested), and the poster. You’ll get all of the above plus a digital download of the film’s soundtrack, “Tinta Verde”. Prepare to be transported and moved by this Andean-Jazz blend of ancient traditional sounds and modern composition. You’ll be making a huge difference, and in return you’ll get all of the above plus an extra copy of the poster and an additional copy of The Essential Neruda. You’ll get everything offered in the Tinta Verde package, plus three additional signed copies of The Essential Neruda and two extra posters, and the thrill of knowing that your generosity has made a major difference in bringing the power of Pablo’s poetry to the world. You’ll get all of the gifts offered with the Compañero donation, plus your name in the film credits! We will also invite you to numerous special events and let you know about special opportunities to get involved..
You’ll get all of the Viva Neruda! donation gifts, and your name will appear with special prominence in the film credits. You’ll be part of the inner circle of major supporters, with all the benefits of the Pablo Neruda! Presente!” donation level, and we’ll reach out to you often to give you the latest updates on the film’s progress, which includes showing you sneak peeks prior to the film’s release! You’ll be a real part of the family and see your name among the most prominently highlighted names in the film's credits. Those who make a (US tax-deductible, as always) donation at these levels will become a vital part of our team. Please write us at info [at] pablonerudafilm.com to discuss the Associate Producer credit and other opportunities that may be available to special supporters. "The best introduction to Neruda available in English... few other books... have given me so much delight so easily." "A splendid way to begin a love affair with our Pablo or, having already succumbed to his infinite charms, revisit him passionately again and again and yet again." "What better way to honor one of the world's great poets than with crystalline new translations of 50 of his most enticing poems?" Quique Cruz (Claudio Durán Pardo) has composed an exceptional score for the movie with his new dynamic Latin Americana group Quijeremá. 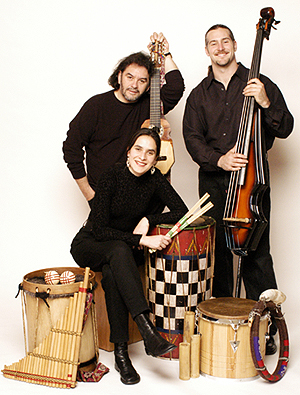 It draws from the musical roots of the Americas, incorporating jazz ideals with South American instruments and rhythms. The album is named "Tinta Verde" after the green ink in which Neruda wrote his poems.